I wasn’t easy to catch the girl who represents India in Ultra Running events – Meenal Kotak to write this article since this ultrarunner spends a lot of time on the roads giving goals to the ultrarunners out there too! But here we are – from this champ ultrarunner’s den! “Every time I see my friends running short and fast, bordering short of disdain I feel sorry for that they are missing out on the not so adrenaline pumping action of the longer version. Shorter version is so stifling!!! As if fast-paced world wasn’t enough that it starts to rub into the runs as well! But, there’s a new world out there. Welcome to the world of leaving your limits behind and running with an adversary inside you. And that my friend is Ultra running. It may be lot slower, takes lot longer but then that’s when the benefits start to speak. You go easy on your training runs, so much so that even a back to back long run doesn’t take a toll. Thus, you go many an extra mile, and in each extra mile you discover more. You discover that you have left your old-self way behind, you discover what challenges you, you make new friends, you discover the camaraderie between your friends, you discover and cherish your one life. To share a little bit of what transpired while being on the Delhi-Jaipur leg of the Great India Run (being led by Arun Bhardwaj) a motley bunch of runners met (me with Jogi sir, Srikanth Reddy, Dinesh Heda, Ranjana Deopa, Nitin). Mostly unknown to each other at the start, but shared such a wonderful chemistry that by the time it was end of our journey, we had forged a new bond in the 240 km of dust, heat, sun and humidity on the Highway. Laugh, giggle, cry, fight, discuss, motivate, help, share moments is what we did. Yes, we ran and walked as well. Those who dare to, get rewarded by chaffing, bruises, and a bit of cramp here and there. gossiping , all amidst your run. Where in world you get to find school students from government schools(on way) smiling at you, trying to talk to you, run with you and gaze at you with all admiration:)…..
……And, at the checkered flag all self-doubts evaporate and you inevitably cry in jubilation. Post your run, you may very well be limping, but each step that you take beckons you to get reunited with the newly discovered unbound you. Perhaps, there are plenty of more experiences out there! A CA by profession, a wife and a full time working woman, she began running sometimes in the latter half of 2013. Gym and running a 10k on a treadmill was her forte. After her first reluctant and yet a sub 2 stint at a half marathon, in 2014 she ran her first full marathon. Injury put a brief hiatus to her ambitions but that was also the cusp. Told by Doctors to put leash on the adrenaline, she decided to go long and slow. Her passion blended with the detective-like skills of Alfredo Miranda in training plans and post-run analysis began a journey which still continues. She set out to challenge herself in the 50km terrain of the Bhatti mines in Delhi in late 2014, and won a podium finish. While she was clueless on how to take her passion forward, she met Arun Bhardwaj, the Ultra man of India, in whom she saw a mentor. He motivated her to leap forward as an Ultra Runner. Soon enough, her name was on the Hall of Fame in the 75km Performax Bengaluru in 2014 and then came the 12hours and the 24 hours run in 2015. She ran the Antarctica Marathon in March 2016 in excruciating conditions. Her Miles-into-Smiles initiative with Joginder Chandna in March/ April 2016 where they both ran a Full Marathon each day for 10 days to focus everybody’s attention on hunger of the street child remains timeless. While they ran, friends and family were feeding poor kids every day. Meenal has a detailed list of heart pumping running exploits. Several podium finishes, more than 10 half marathons, pacer at many national events, she has also set a course record. Truly, an Unbound Runner. Very well described Meenal. You are truly an inspiration to many. Thank you Meenal for sharing with us a glimpse of your Ultra running experience, you are an inspiration for all running enthusiasts. Best wishes! 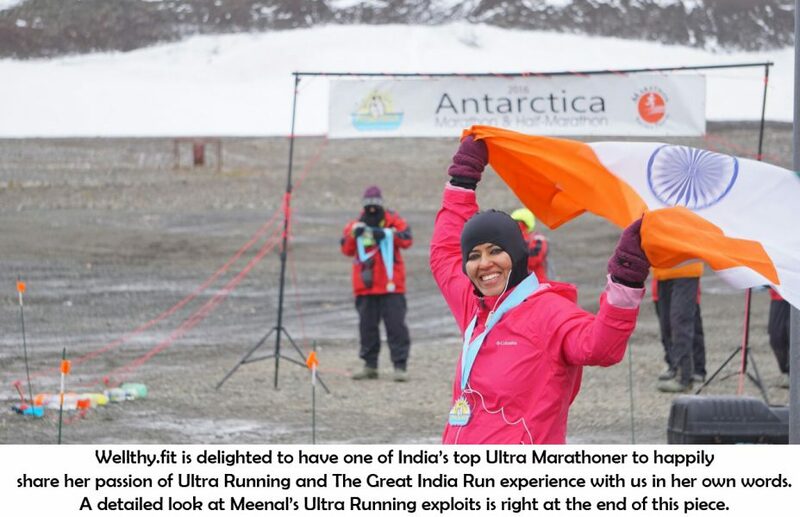 Thanks Meenal for such an inspiring and illustrious ultra life !. I met you briefly on one morning when i become curious about the running gear you were wearing. Thanks again for inspiring a new comer like me.